After realizing just how much work college is, you’ll soon find yourself at one of the many libraries on campus. Most will end up at College Library, and I’m here to tell you why that’s not a good idea. The 3rd floor quiet section of College Library is where everyone goes to get their work done but actually ends up talking to their friends for seven hours straight. I pulled way too many all-nighters due to my procrastination on 3fq, so please learn from my mistakes. Any cafe on State St. The best of them all…The Terrace. 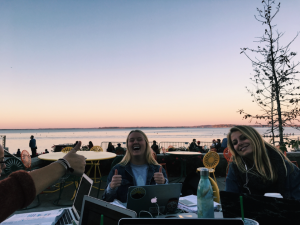 Finals week can be brutal, so make it easier on yourself and go to a different library or study while watching the sun set on Mendota.